← RAF Kinloss and the Russian Sputnik that landed at Ardgay in Scotland? Your first Team leader has a huge impression on you in my case was George Bruce a small wiry Scottish Team Leader with a with a mind as sharp as a razor. I tried to join the Mountain Rescue as soon as I arrived at RAF Kinloss as a 7 stone and really a skinny wee lad. I was sent away from the Mountain Rescue by some of the Team who said that they thought I was too skinny. It was just the type of thing that happened in these days and this was just after the Cairngorm disaster in November 1971. The Cairngorm Disaster which is well document in my Blog dated 20 Nov 2011. In this tragedy 5 children and an adult had died on the plateau in November 1971 and the RAF Kinloss Team, Glenmore, Cairngorm Team, Braemar, Aberdeen and SARDA were all involved. It was a tragedy that was change mountaineering for ever. The Kinloss Team was very strong at this time with some huge personalities and characters. George was a non drinker and ruled the team by his strength of character. He was not the best mountaineer by far in this team but what a man manager and got the best out of his team. He was a bit of a Bill Shankly / Alec Ferguson/ Billy connelly his management was superb. His sense of humour was marvellous and his public speaking without notes incredible. He had a way with words that could cut you down in a second if you needed it. He had incredible contact with each estate and new every keeper many who remained friends long after he retired. He kept the Officers and the powers that be in their place and looked after his men whatever they did. He had a knack of on a big callout being able to work with the Police and other Team Leaders easily due to his people skills and could fight his corner when needed. He looked after us all and often gave me a few words of wisdom behind the office door. Outside of the team they got into a few scrapes but George was always there to sort it out. He looked after me when I joined and made sure that I was kept on the right track. It is amazing how such a man can effect you life in the future. George ended up at Grantown On Spey at the Centre there before he retired. He was a Physical Training Instructor and a parachute Instructor, one of the finest in his day. 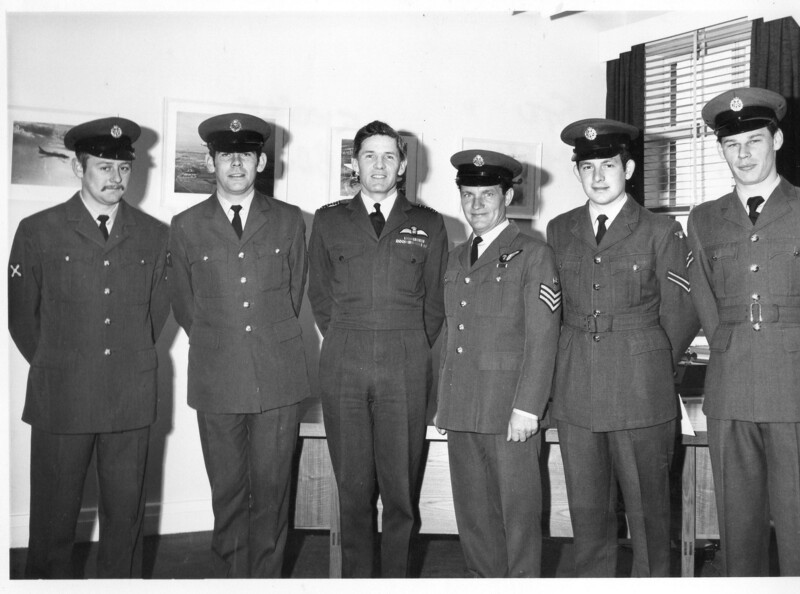 At this centre he had many visits from the senior officers of the RAF. George would regal them with stories, one day a very high senior officer of “Air Rank” near God in the military forgot his rucksack arriving in the Cairngorm car park in a wild day with no gear. When asked where his rucksack was he said I do not need it George as quick as always said the immortal words” the mountains have no respect for rank , you had better get back and get it. I was very lucky to meet and work with such men as George Bruce, Ray Sefton and Pete Mc Gowan legends within the RAF Mountain Rescue. When times are hard you need such people. Members of the RAF Kinloss Mountain Rescue Team involved in the Cairngorm Tragedy.. They were all given a presentation after the tragedy for their part in the recovery of this tragic event. George is the Flight Sergeant in the middle. A very rare photo of the troops in their best uniforms! The Team was fairly steady when I joined and helicopters were being used more and more on Rescues. The civilian teams were now better equipped but still used the RAF teams in the big incidents. Winter climbing was now very popular and Avalanche accidents were very common. Little was known about them at this time and the first big callout in 1970 involved Jim McCartney an outstanding and up coming winter climber and friend of Tom Patey being killed in an Avalanche on Ben Nevis with two companions. The Lochaber Team and RAF Kinloss were involved in the recovery. Mary Anne Hudson and ex WRAF from Kinloss was also killed. 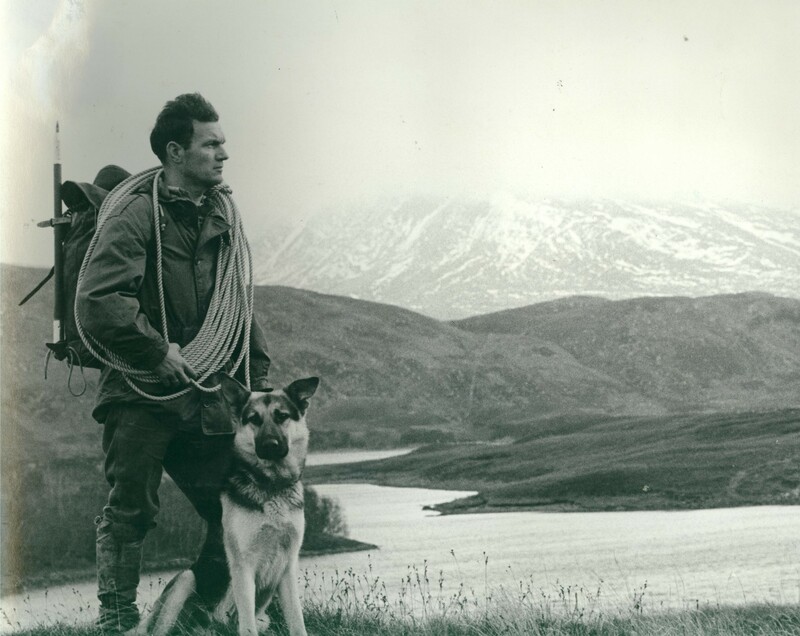 John Grieve now (Team Leader of Glencoe) was the only survivor of an accident that rocked Scottish Mountaineering. As I stated before mountaineering and climbing was a very close affair even in these days. At times you were rescuing or recovering friends. This is never easy to do. Yesterdays story on the Sputnik has got some attention and the BBC have put a piece on their website. Some of the major incidents the team were involved in from `1970 – 1980. 1970 – 19 Jan – Ben Nevis – Italian Climb- slab avalanche one survivor 3 fatalities. One of the fatalities was an ex WRAF from RAF Kinloss. 1971 – 21 November – Cairngorms Disaster – Feith Buidhe Ben Mac Dui 6 fatal 5 children and 1 adult. The worst mountain tragedy to date in Scotland 2 survivors – 3 of the Kinloss team decorated for their efforts on the Search. 1972- 1 September – Ben Nevis – Tower Ridge, 3 fatalities, Navy party. 1975 – 25 -31 December – Isle of Mull Missing aircraft – Cessna- found 7 years later. 1975 – Skye – West Buttress Sgurr Na Ciche 700 feet lower. 1976 – 15 -20 March – Glen Doll – 2 missing walkers in Jocks Road. 1977 – 8 -9 January – Torridon – Liathach Northern Pinnacles 9 Jan – ATC cadet fell 800 ft, 17-hour epic, carry off with team. 1977 – 12 January – Cairngorms – Loch Avon – Helicopter Crash on Frozen Loch. KMRT Team Leader Ray Sefton found both survivors walking out. 1978 – 28 January – Northern Scotland – Great Blizzards– rescued over 150 people in a 10-day period. Team based in Inverness. A9 blocked for days. This entry was posted in Articles, Book, Friends, History, Mountain rescue, Mountaineering, Views Political?. Bookmark the permalink. Hi Heavy,good article,I was never on a team with George,but felt I knew him quite well from many winter/summer courses,amazing man as your article made clear,George was not the best mountaineer on the teams,and in MR your status was linked to your ability as a mountaineer/rescuer and not your rank.There was never any question who was in charge when George was around. Would like some names on the photo ,apart from George the only one I know is “Bugs” Rabbitts ,hope the ‘do” on the 27th goes well,please pass on my best wishes to JIm Morning and John Cosgrove if they attend. Yes Woody in the photo Marty, Bugsy, Stu MacKenzie Juliian Ashby. Thanks for the comments, will pass on to Jim and Pam & John and Mary. George and men like him were unique, I was very lucky to have met him. .. Thank You for the kind words about my Dad. It’s funny we left Kinloss when I was 8 so i don’t remember much at all. My most vivid memory is the a team photo being taken around a Land Rover I was sitting in the spare wheel that was mounted on the bonnet sadly i don’t have the photo. I do remember a member of the team saying look at this magic and he opened a tin and pulled out a bar of chocolate. Now for a 8 year old that was impressive. I’m guessing that was a ration pack he had? Rob – George was a great man and a huge part of my life. The compo rations were incredible and had tinned chocolate and sweets, great for us all, not just the kids. What a great man, he lives in all our hearts and we regularly speak of him. George was my boss and yes he was a born leader with management skills that were superb. I applied for the job as Radio Op in the KMRT and had to do 2 weeks probation. He dragged me up the 5 Sisters to test me…..it did. Then he forced me to drive the signals Landrover around the back streets of Nairn to see if I could drive. We swapped cameras prior to his expedition to Antartica, so his penguin and petrel photos were taken with an Petri FT SLR. Good memories Heavy ! George was a great mentor of me and I was given the great honour at his funeral of helping lower his coffin. I like many owe so much to George Bruce. That is typical of George! I came across this site while doing some research for a charity event my family and I are doing this August, it makes for an interesting read. My dad Iain Macfarlane was one of the three that died on Tower Ridge, Ben Nevis in 1972, he was one of 3 in the party, all perished. It is thanks to MRT all over Scotland that the families get to say goodbye to their loved ones when tragedy strikes. We are planning to ascend Ben Nevis this August in memory of our Dad and the others that died almost 41 years ago. Brian – Many thanks for your commentson such a tragic event. I was a very young lad on that incident in the RAF Kinloss MRT and climbed the route Tower Ridge with John Hinde straight after the sad incident. It was a real tragedy and made a huge impression on me. Have a lovely day on Ben Nevis in August I will be thinking of you all. Thanks for your comments, I didn’t realise the Kinloss had also been on this shout? I was not quite 4 when it happened so have no real memories of my Dad, this summer we will remember them and raise some money for the Lochaber MRT and Help for Heroes at the same time. Military service is important to us as a family, I have one brother still serving in the RAF, my other brother and I were RN and my nephew is starting with the Army within weeks. This year is the 41st anniversary of the tragedy, we had planned to do this climb last year however I was having a total knee replacement after an accident while working as Coastguard Cliff Rescue. I hope your day goes well for the family, I thank you for your comments and thoughts. Thanks Archie – he was a great man – he was so good to me, sorely missed! your stories are amazing about George Bruce. he is my grandfather, and heard many stories over the years. this is fantastic. thank you. He was a great man Stacey and you should be very proud of him. I am so glad you have William he was a great man the likes I have never met again. He was a huge influence on me and I cannot repay him for having faith in me. He would be glad of your comments keep his wise Council and never forget him. How is your Grandmother ?